As a general rule, I do my best to avoid catching any live theater performance during its opening weekend. It's practically a superstition when you think about it, but I prefer to give the cast and crew that first weekend to get used to the venue and the working environment as a whole and to work to kinks. Even a touring company that has worked together for a few months still needs time to get used to a new stage and all that jazz. 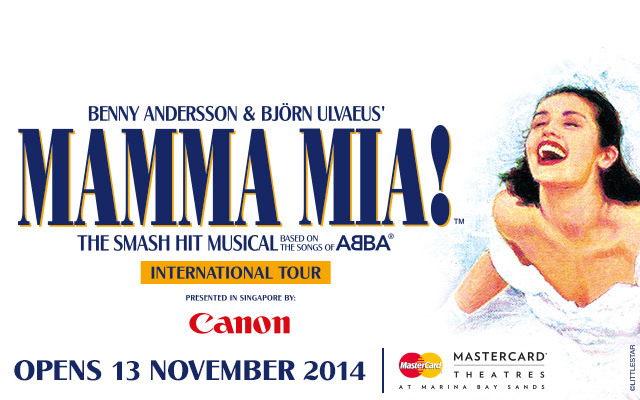 But one thing led to another and circumstances had us catching the Singapore leg of Mamma Mia! on tour precisely during its opening weekend. And while the material in itself is pretty strong and can survive most encounters, there was something somewhat lacking in how things came together. But at the same time, I can totally see how things can still work out for the team given another week of shows or something. Synopsis: Mamma Mia! is a jukebox musical based around the music of ABBA as composed by Benny Andersson and Björn Ulvaeus. The musical was written by British playwright Catherine Johnson and first debuted on the West End. The Singapore run began November 13 and is set to end its extended run by December 14, 2014 at the Marina Bay Sands Theatre. We first meet 20 year old Sophie (Niamh Perry) who is engaged to marry Sky (Bart Edwards). But she wants her father to walk her down the aisle and gambles on three possible men from her mother's past that might be her father. She pretends to be her mother as she invites all three of them to the wedding and hopes for the best. We then fast-forward to the day before the wedding and Sophie shares her big plan with her best friends and the fact that all three men have decided to take the invitation. On the flip side we meet her mother, Donna (Sara Poyzer), who is busy with the wedding preparations given it'll be hosted at their modest little taverna. Her own best friends from the days when they were all in a girl group known as "Donna and the Dynamos" also arrive for the wedding. Tanya (Geraldine Fitzgerald) is a rich thrice divorced individual, while Rosie (Sue Devaney) is a single, carefree woman. Then the men from Donna's past arrive, these being Sam (Richard Standing) the architect, Harry (Keiron Crook) the banker, and Bill (Michael Beckley) the adventurer author. And so you can imagine how crazy things are going to get with everyone together in this little island. First, the set for this musical was amazing. The simple design of the two curved set pieces that rotate and reconfigure into the different parts of the island worked really well with the relatively bare stage. The intricate pattern on the floor helped flesh out the design of things with the set pieces aligning in surprisingly new ways with every scene. The lack of more comprehensive backdrops apart from changes in the overall lighting was a rather bold way of present the various scenes and I really liked how this worked. The very exposed nature of the set also meant that the crew that would bring in additional set pieces like tables, chairs and beds would enter the stage more or less "in character" as silhouettes every time. Lighting was a little inconsistent and there were a number of scenes that felt a little too dark or lacked better contrast. Given all that was meant to be going on in the show, it's shame that some of the action just didn't come across as well as it could have. The casting was generally good with most of the key players possessing some great singing talent. There were odd moments of flats, sharps or just downright tinny voices that I suspect might have been more a challenge of the night's performance than indicative of the overall quality of the group. Particular mention of course has be cited for Sue Devaney as Rosie given she was the most on point in the whole cast all throughout the show. I was a little disappointed with the supporting ensemble since their movements during the big dance numbers seemed to lack that level of snappiness in their actions. And given how a lot of the show's numbers require the entire ensemble to move as one whether in terms of them popping their heads over the edge of a wall or looking at Donna all at the same time, even the slightest hesitation or delay becomes immediately noticeable. On the whole, I still feel great about having gotten a chance to catch the stage version of this show and I think I now have a better appreciation for some of the decisions that went into which songs would and wouldn't get into the movie adaptation from a few years back. The stage version still has all the heart that you could expect from a musical that celebrates the music of ABBA, although this performance could have been a bit more fun or something along those lines. Mamma Mia! in Singapore is still a play that is worth catching, especially if you already love the music of ABBA. I'd like to think that my few concerns about performance levels were a fluke and should resolve themselves in time - or I'm just being nitpicky. The performance still gets 3.5 crazy 70's costumes out of a possible 5.